The 85-foot-long arm was delivered to the base of the Pad 39A at Kennedy Space Center on August 15. Five days later, it was raised by crane 265 feet above sea level, and there it was mounted to the space shuttle tower. The new walkway is pretty high up on the tower several stories higher than the one that extended from the FSS for 30 years and allowed access to NASA’s now-retired space shuttle orbiters. The shuttle walkway is now installed about 195 feet above the ground. Both Crew Dragon and Starliner are reusable capsules that can carry seven passengers. 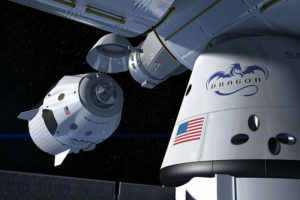 But the spacecrafts will carry only four astronauts during the contracted ISS flights, according to NASA officials. Earlier this month, NASA announced the first astronauts who will fly in SpaceX and Boeing spacecraft for the agency’s Commercial Crew Program: Bob Behnken and Doug Hurley will fly SpaceX’s crewed demonstration mission, and Mike Hopkins and Victor Glover will take the first operational ISS flight.The first crewed test flights, which will use Boeing’s CST-100 Starliner and SpaceX’s Crew Dragon vehicles, are currently scheduled for 2019.